Inspired by legends, worn by new heroes, PUMA FOOTBALL brings you the AC MILAN 2018/19 Away kit. Dubai, UAE, July 16, 2018: The away shirt comes in the legendary white that has adorned the backs of legends during eight major European finals. The shirt features a round neck collar with red and black detailing, a black line graphic across the chest, back and arms reminiscent of the 90's era Milan away kits and the ‘Diavolo Rossonero' (The Red & Black Devil) on the back of the neck. The shirt will be accompanied by all-white shorts and white socks with a red and black band on the trim. PUMA FOOTBALL unveiled the new AC Milan away kits on July 9th evening at Spazio 21 (close to Piazza Tricolore), a post-industrial location usually used to host catwalks in the capital of fashion, but now for this event, totally transformed into a center for Milan's football and street culture. The event started with a traditional kit presentation to the media with Marco Fassone (AC Milan CEO), Bjoern Gulden (PUMA CEO), Gennaro Gattuso (Head Coach Milan AC), the captain of AC Milan Leonardo Bonucci and his teammates Giacomo Bonaventura, Davide Calabria and Hakan Calhanoglu. Then, the event hosted a 400-strong crowd of football-loving teens, influencers, and VIPs in a highly immersive experience, designed for maximum expression at the meeting point of football and the cities thriving underground scene. Alongside a high energy ‘Panna' nutmeg tournament with professional football freestylers, the artist Luca Barcellona customized jerseys live onsite, based on real-time social interactions with the fans. 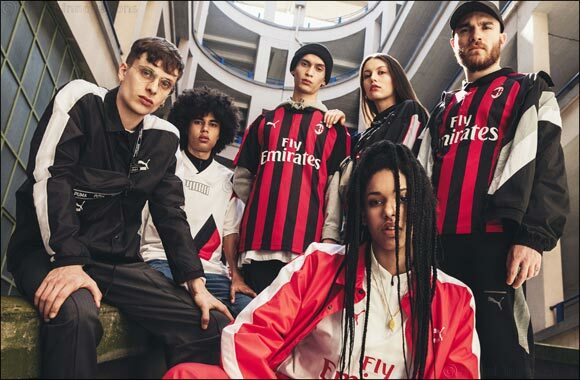 Max Brigante the Italian DJ, and radio host then introduced Ernia, a local rapper and fan of AC Milan to the stage who revealed the away kit in the presence of the Milan players. This unveiling happened to his soundtrack “LA PELLE DEL PUMA” (the skin of PUMA) which was initially released last February to tease the upcoming partnership. AC Milan are part of an impressive roster of PUMA Football clubs including Borussia Dortmund, Arsenal FC, Olympique de Marseille, CD Guadalajara, Borussia Monchengladbach, and National teams such as Italy, Switzerland, Uruguay, Senegal and Serbia. PUMA´s football portfolio also includes some of the world´s best players, such as Romelu Lukaku, Antoine Griezmann, Olivier Giroud, Sergio Ag�ero, Marco Reus, Julian Weigl, Adam Lallana, Cesc F�bregas, Mario Balotelli, H�ctor Bellerín, Petr Čech, Gianluigi Buffon, Nacho Monreal, Allan Saint-Maximin and Marco Arnautović.